A group of strong, courageous feminists won this year’s Skrekkur, which is an annual talent contest, held by the secondary schools in Reykjavik. 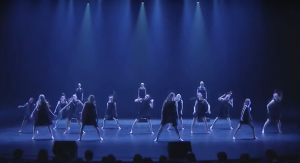 Hagaskoli, a school in the West Side District of Reykjavik, won the prize with their feminist poetry and dance. The piece was written and choreographed entirely by the teenage girls themselves, with Una Torfadóttir, Erna Sóley Ásgrímsdóttir og María Einarsdóttir leading the team. Icelandic women are a force of nature, fighting for equal rights with all means. The winning piece sort of embodied the recent revolutionary campaigns, like #freeTheNipple and #outload. HERE you can read more about what’s been happening this year. As I’ve said it before; the fight for equality is far from over, but at least the future is bright when young people are as strong and courageous as this!